This Types of Fans are Generally used for Small Areas such as Bathroom,Toilet or Small Cubicles. This Fan Can also Be Used as a Machine Cooling Fan. This Fan Should Not Be Mistaken as a Kitchen Exhaust Fan. The Fan Size is 170 X 170 X 5 in mm. 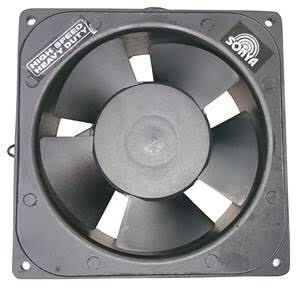 These Fans are Designed for Force-air Cooling of Electronic Devices. The Purpose of the Ac Fan, as Well as Any other Cooling Fan, is to Protect the Electronic Devices in the System By Keeping Them At An Optimal Cooling Temperature. The Fan Will Generate Cool Air By Spinning At Variable Rates, Thus Protecting Against Thermal Variances that Will Undoubtedly Harm the Devices and Will Prevent Premature Failure. Optimum Performance of Your Equipment is the Fan's First Priority. Computers, Electronic Components and Machines Today have Increased in Power Consumption Resulting in An Increase in the Amount of Heat Produced By the Components in Computers. in Order to Function Effectively and to Avoid Overheating, Malfunction, Instability and Breakdown Leading to a Shorter Lifespan, These Components Need to Be Kept Within Some Specific Temperature Range. An Ac (alternating Current) Cooling Fan Operates By Blowing Air Along the Axis of the Fan. Our Ac Fans are Available in Frequencies of 50 Hz and 60 Hz. Ac Cooling Fans are Found in a Variety of Applications Where the Need for Ventilation is Important. also Our Fans are Used in Homes and Offices in Large Scale.